Shalom l’kulam! (Hello to everyone!) We’ve had an exciting few days! 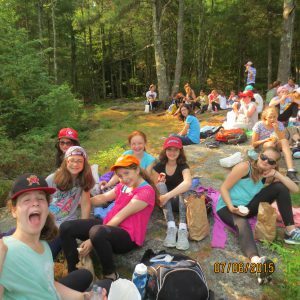 On Monday, July 6th, the banot (girls) started the day off with a hike up Saddleback Mountain- a Yavneh favorite. We got energized for the day and went on to celebrate the 4th of July with the entire machaneh (camp)! We had a parade, a dance party with all-American songs, and a traditional 4th of July dinner with fried chicken! At night, we had a talent show, introducing Yavneh’s finest talents, complete with singers, dancers, instruments and other impressive acts! We finished the night with a spectacular fireworks show and went to bed feeling excited and proud of our beautiful country! On Tuesday, we said goodbye to our chanichim (campers) in Kaytana (1st-year chanichim at camp for 2 weeks). We hope they have a wonderful rest of their kayitz (summer)! Tuesday was also a very rainy day, so we had a lot of indoor activities. We started learning the songs for Zimriya, the camp’s singing competition. This is a much anticipated event which will be happening a week from today, on July 16th. The singing was just so much fun, so we kept going and had a karaoke peulah (peulah) for the entire aydah (unit)! Each tzrif (bunk) picked a song and performed it together. We had a great time! When it really started pouring, we went in to beit h’am (the gym) and played some sports. We finished the day with a relaxed peulah chinuchit (educational activity), where we talked and learned more about the theme of the summer-כל ישראל ערבים זה בזה (all of Israel is responsible for one another). Wednesday was the best day of the week-achla yom (trip day)! 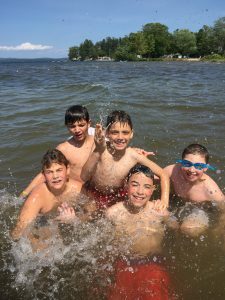 Each achla yom is a special day where we either leave camp to go on an adventure, or we stay in and have fun and exciting activities planned for us (like the Kerem Carnival last week). This achla yom was especially achla (cool) because aydat Kfirim got to go to Mount Major, where we hiked in two different groups and met at the top of the mountain. 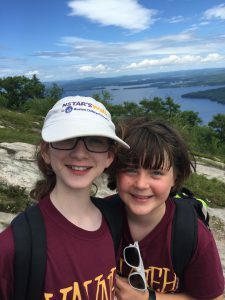 The view was breathtaking and the chanichim were great– they helped each other out during the hike and were incredibly supportive! Afterwards, we went to cool off at Lake Ellacoya and went back to camp to shower and have a BBQ dinner, as we do after every achla yom. We look forward to the rest of the fun things we’ll get to do soon! Have a great day and Shabbat Shalom!